Work on Ayr’s iconic pink buildings is continuing at a pace, with the refurbishment programme well under way and the ‘big reveal’ getting closer and closer! Visiting the site to see progress were South Ayrshire Council Leader, Councillor Bill McIntosh and Councillor Bill Grant, Portfolio Holder for Economic Development, Tourism and Leisure, who were joined by Gordon Fleming of architects ARPL. They saw the original stonework of the buildings some of which are being revealed for the first time in hundreds of years and more a sandy colour, with a hint of pink, than the vibrant pink paint that had been applied in later years. They were also shown sample panels of weather resistant render, to be applied to the rear of the buildings, carefully matched to complement the current pink shade. The buildings at 1-3, 2-6 and 6a-10 New Bridge Street, comprising a total of 12 flats and five shop premises are being transformed as part of the £2.5 million Ayr Townscape Heritage Initiative (THI) – funded by South Ayrshire Council, the Heritage Lottery Fund (HLF), Historic Scotland and owner contributions. The refurbishment and conservation work will see the buildings restored to their former glory, with all repairs and works undertaken using traditional methods and materials to preserve the special historic and architectural character of the buildings. And, recognising the iconic importance of the pink colour, the refurbishment at the rear of the buildings will also benefit from the same sustainable and weather resistant processes – and finished as close to the existing pink colour as possible. Behind the scenes, builders have been hard at work, dealing with crusty paint, broken tiles and crumbling stone – but they were tickled pink to discover a nest of young chicks huddling in a hole in the wall as they were removing plasterwork. The kind-hearted workmen protected the nest and worked as quietly as possible around it to avoid disturbing the birds until they had flown the coop. 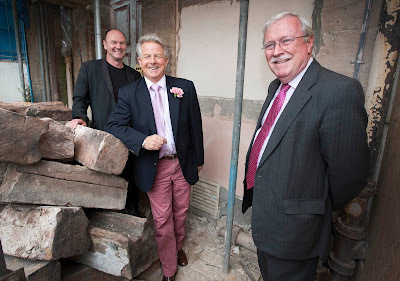 All work is expected to finish by the end of 2014 and Councillor Bill McIntosh, Leader of South Ayrshire Council, commented: “It’s exciting to see the amount of work completed so far, and the buildings will look absolutely superb when fully restored to their former glory. Evelyn McCann, Acting Chair of Ayr Renaissance, said: “The refurbishment works are well under way, and it was tantalising to see the original stonework, some of which are being exposed for the first time in three centuries. Councillor McIntosh concluded: “The Ayr THI refurbishment works will give a new lease of life to these fantastic buildings, and set the tone for anyone entering the town. The works will be completed as part of the £2.5 million Ayr Townscape Heritage Initiative (THI) – funded by South Ayrshire Council, the Heritage Lottery Fund (HLF), Historic Scotland and owner contributions. The level of owner contributions vary according to the specification of the works required. Ayr THI will be delivered through a sympathetic conservation and refurbishment programme that ensures the special historical and architectural character of the buildings is properly maintained. ARPL Architects and contractors CBC will carry out all works using traditional methods and materials and in line with best conservation practice to help preserve the history of the buildings and town, while ensuring they can enjoy a sustainable future. ARPL Architects and South Ayrshire Council are Founder Members of the Elite Ayrshire Business Circle.